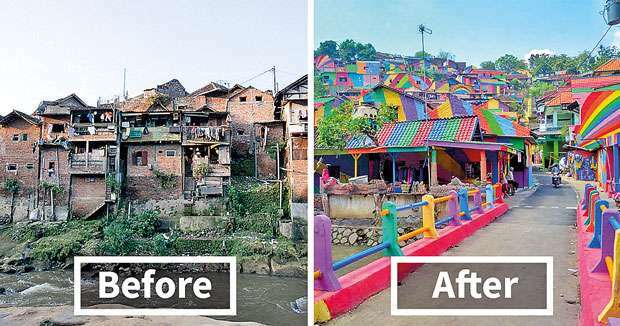 Tucked away in the small village of Kampung Pelangi in Semerang, Central Java is now an official Instagram sensation after being painted with all the colours of the rainbow. Following the trend started in other Indonesian villages of Kampung Warna-warni and Kampung Tridi in Malang, and later Kampung Kali Code in Yogyakarta, 232 homes have been converted into works of art. Initiated by 54-year-old junior high Principal Slamet Widodo, the project was created with the aim to make the “slum” areas beautiful, therefore giving the residents a chance to be actively involved with the improvement of their homes. 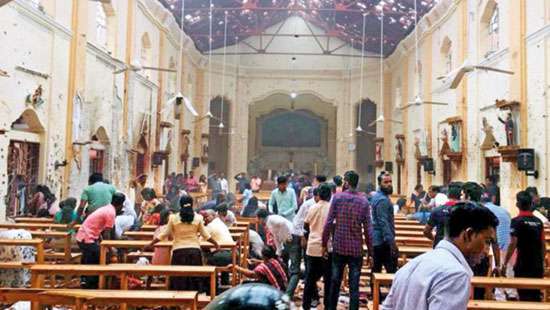 Every house, shop, pavement and even the mosque have been covered with brightly coloured paint, donated with the help of the government and generous individuals to the cost of USD 22,000. Each house uses at least three different colours of paint but the real gems are the painted art that adorns many of the walls. A giant set of blue wings adorns the side of one building while cartoon monsters and animals are also popular. 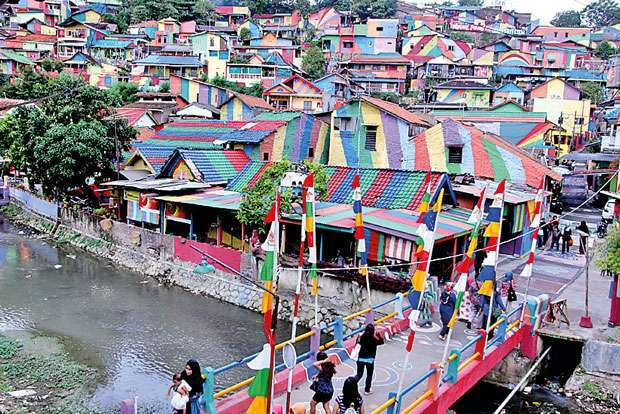 From 3D designs to polka dot print, the designs are candy-shop pretty, with plans already for another few hundred houses to be painted in the hope that Kampung Pelangi will become the largest rainbow village in Indonesia. The money generated by tourism will inject some much-needed cash flow for the development of the village, and tourism is already on the rise with eager explorers both local and foreign, coming to get that perfect social media snap. 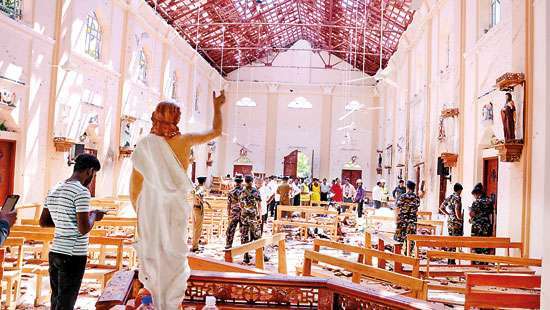 Benefits to the economy by growing tourist numbers have already been noticed, especially by food outlets and souvenir shops. The next step in improving Kampung Pelangi is the cleaning of the heavily polluted river, another step in the right direction for the development of the rainbow village into a home and community, the residents can be proud of, and enjoy for years to come.